The new Zelda does not feel like a game to skip, I'm happy to report after having played the game for five hours. Even if you've grown tired of Zelda games. I'll spoil nothing about The Legend of Zelda: A Link Between Worlds, but will share some important findings (!) with you about the November 22 3DS game. As a matter of set-up, if you don't know what this game is, it's a portable sequel of sorts to the classic Super Nintendo game The Legend of Zelda: A Link to The Past. That game, like this one, is a top-down action-adventure that stars a left-handed sword-swinging boy named Link. You explore a world of forests, castles, dungeons, lakes and mountains, trying to rescue the kingdom of Hyrule. In A Link to the Past, you discover that there's a parallel dark world to also explore and clear. You can hop back and forth between light world and dark world. This new game is set in what is more or less the same map of Hyrule and has its own twist on the dark world concept. It also lets you squish Link into what looks like a flat, 2D sketch in order to move along and around walls or any other clean vertical surface in the game. The item rental option is the best change to the Zelda formula in a generation. Very early in the game, you meet a character named Ravio, who will allow you to rent just about any item in the game: bombs, bow and arrow, whirling thingamajig that tosses you in the air, etc. This is not a microtransaction system. This is not a prelude to the confusion of carrying the wrong item into a dungeon. Rather, from what I've experienced, this is a way to finally—FINALLY—give experienced Zelda players a way to dig into one of these games more aggressively without handholding. See, they've paired this new system with the removal of any wallet limitations. You can start collecting and hoarding in-game Rupees/money immediately. With that cash, you can rent many more items than you would ever have early in a Zelda game. You don't need most of them right away. Each dungeon that I've played—four so far—only seems to require one new one at a time. But if you start running around with a bunch of items you don't need yet, you'll be able to access a lot of otherwise inaccessible areas. In other words, if you rent items early, you'll be ahead of where the game needs you to be and the game is fine with allowing that. You can succeed more quickly. There is one restriction on rented items. Ravio takes them back if you die. That's a fair trade-off. I'm no Zelda novice, so I've been opting to rent a lot of items on the assumption I won't die. That strategy has mostly worked. It has allowed me to beat more enemies, earn more money and find more hidden stuff. I have died once or twice and seen all my rented items taken away. That has stung more than the average death in one of these games, but I enjoy playing Zelda in this riskier, optional way. About a few hours in, the game allows you to buy Ravio's items. Something that cost 50 Rupees to rent will cost 400 to buy. You can buy items you don't need yet, but you won't lose them if you die. You can also upgrade items to make them more powerful. Just about every Zelda game before this one doled out items through the dungeons. You 1) went to a dungeon 2) found the item you needed to get through the dungeon in that dungeon 3) and then cleared the dungeon. With this new rental system, you're no longer getting items in dungeons, but you still need certain items to get through certain dungeons. What happens if you show up at the dungeon with the wrong one? It's not much of a hassle. Early dungeon entrances are marked with icons that indicate which item you'll need in the dungeon. Fast-travel options let you quickly get back to Ravio's shop to grab the object you need. 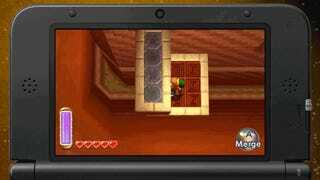 If you want to, you can play A Link Between Worlds on a Nintendo 2DS or on a 3DS with the 3D turned off. Please don't do that. The game's use of glasses-free stereoscopic 3D is a marvel. The game's world is viewed from an overhead perspective. The 3D effect accentuates the depths and heights of the world. That much I expected. What has surprised me is how well various pop-out effects are being used. For example, when you shoot an arrow into a stone wall, it doesn't ricochet back so much as it also ricochets a bit up, seemingly out of your 3DS screen. It's not distracting. It looks cool. From time to time, Nintendo game designers will claim that the 3DS' 3D effect makes some gameplay easier, that it enables the player to more effectively judge heights and distances. I don't buy that. It's pure cosmetics, as far as I'm concerned, and the 3D look of A Link Between Worlds is great. Launch Link into the air and nearly out of the screen and I think you'll agree. Every Zelda map holds a lot of secrets, but many recent Zelda games pretty much walk you up to them, tell you where to dig and practically open the treasure chest for you. 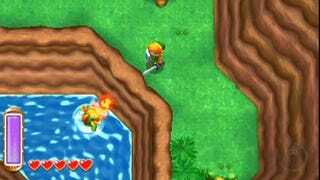 A Link Between Worlds turns away from that and takes an approach that feels more similar to older games in the series. As I've played, I've repeatedly come upon odd nooks and crannies, walls I think I can bomb, weird structures, strange characters and so on. (I also came upon what I think is the first in-game rapper in Zelda history, but that's another story.) I'm able to drop up to 20 pins on the game's main map to mark things that I'm intrigued by and want to return to. I've been doing this a lot. One drawback: Zelda games on the DS let you scribble notes on the map. You can't do that here, for better or worse. With the pin system, you have to remember why you thought the area was interesting. The game holds your hand a lot less and expects you to explore and choose what you want to do next. I'm at a point where I think I can access about a half dozen major dungeons depending on which one I feel like trying next. There is a lot of rehashing of the overall flow of A Link To The Past (which was then used in many of the sequels)... A few dungeons. The castle. Then the big reveal of the real scope of the game. Your mileage will vary on how wonderfully nostalgic this is vs. how been-there-done-that this feels. Dungeon design remains excellent as it's been through the recent Spirit Tracks and Skyward Sword Zelda games, offering some minor head scratchers and including a decent amount of optional discovery. The major new action—being able to flatten yourself and move along walls in 2D is fun but hasn't been fleshed out a lot by the point I am in the game. The music, much of which consists of remixes of A Link To The Past, is Soundtrack of The Year material. They've done something fun with bees. This preview is based on unlimited, unsupervised hands-on time with a retail version of the game. To contact the author of this post, write to stephentotilo@kotaku.com or find him on Twitter @stephentotilo.